14k Gold Rhinoceros Pendant This is a piece of jewelry for a very special rhino lover! 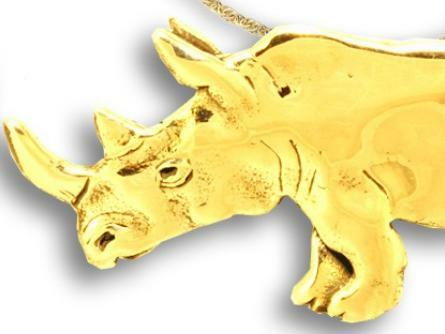 This is a piece of jewelry for a very special rhino lover! 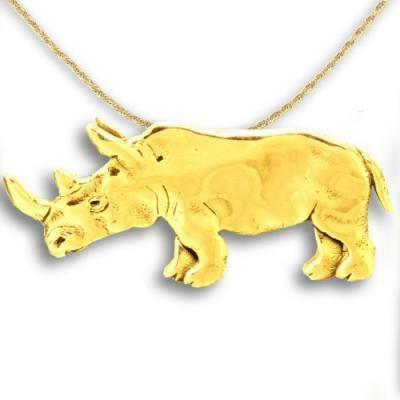 The 14K gold rhinoceros pendant is an unusual and striking design for any rhino lover. Measuring 1/2" tall by 1 1/4" wide, it is a substantial piece of jewerly, sure to be noticed. There is a 14K gold bail attached to the loop on top of the pendant so you can slip your chain right through it. The bail opening is 3mm wide, so it accommodates most chain widths. 14K gold chains are sold separately.